Once you have registered, you find yourself on the overview page of your new banana plantation owner. Here you can find important information about your character and also the link with which you can recruit new banana plantation owners in the far reaches of the internet by placing the link appropriately. For example, you can send the link to your friends, place it on your homepage or use it as a signature in forums. 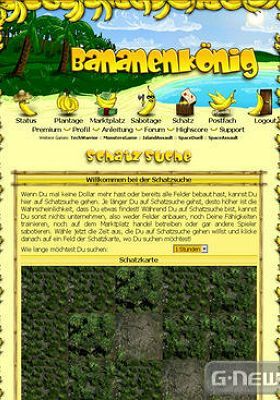 If a would-be banana plantation owner clicks on your link, you receive a couple of Dollars and bananas (1-3) as a reward. 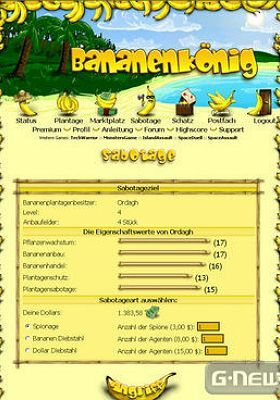 If your victim registers for BananaKing, you have created a new banana plantation owner. 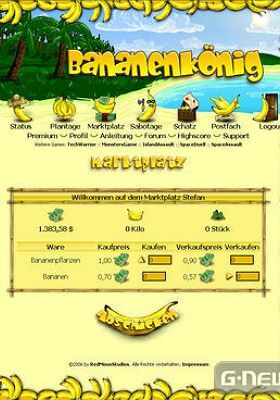 Each time someone clicks on the link of the banana plantation owner you have created, you receive one Dollar and one banana ! Once the character(s) you have created with your link has reached level 3, you receive 50 Dollars and 1 Experience Point! You can invest your Dollars in training for your character to improve his/her abilities or you can use them to improve your plantation. You can also hire agents and spies to carry out acts of sabotage in enemy plantations. By doing so you can gain Dollars or bananas.